When your max lifts get stuck at a number and you can’t push past it, it’s known as a plateau. Every experienced lifter hits a plateau now and then. One way to overcome it is to push past it in tiny increments, called microloading. Fixed-weight dumbbells in 5lb increments mean you have to jump 10 lbs for every exercise involving two hands. With olympic weights, the smallest plates you’re likely to find are 2.5lb, making it a 5lb jump with a pair of plates. 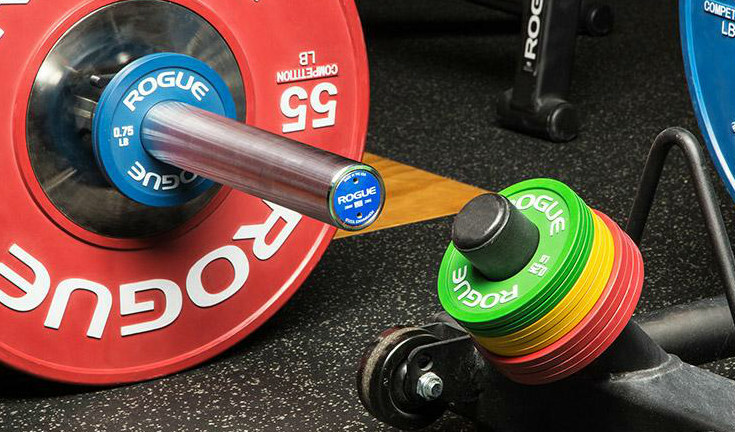 So you need a way to add smaller weights. Most weight lifting equipment manufacturers haven’t bothered with 1.25lb olympic plates. I’ve had so many customers ask me if I had any. The answer has always been no… but now after some searching I can at least point them to some great options! Note that some fixed weight dumbbells come in 2.5lb increments. York has some rubber dumbbells in 2.5lb increments, and Troy does it with all their pro-style dumbbells. But even then, it’s only up to 50lb, and you can’t get any smaller than 5lb jumps with two handed exercises. You’re paying more per pound than other iron plates, but they do have em! This is the most elegant solution. Rogue sells these as shown above in sizes from 1/4 lb to 1 lb. They are color coded, with rubber coating. If you only need 1.25lb plates, Rogue has them in their normal cast iron plate style. Ader Fitness has some good ones on Amazon that are lower priced for a full set, especially with the free shipping. They don’t have raised white lettering like Rogue’s, but the weight accuracy is VERY good, and they are powder coated. Ader Fitness is a good brand. Rogue actually stocks Ader kettlebells. These instructions for chains work for olympic bars only, or olympic dumbbell handles. It’s a bit cheaper than a pack of steel washers as above. 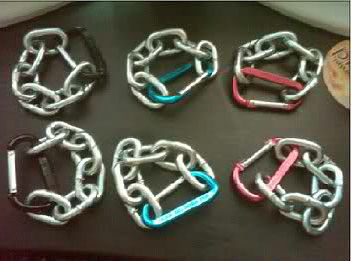 One super easy and cheap way to microload is to use some small steel chains and quick links. Go to Home Depot and have an employee cut off some small lengths of chain totaling 1.25lb and .625lb. Or do .05lb less than that to allow for the quick link weight. The table below illustrates the right length. The size of a chain is measured by the thickness of the wire. The above is just FYI. Use the table below for what length chain to get. 7″ is a great length for our purposes. Wrap it around the bar sleeve, attach a quick link, and now you’ve got a bracelet you can slide on and off the bar sleeve without messing with the quick link again. PlateMates are a product that was engineered specifically for microloading dumbbells and olympic weights. They have magnets in them so you can attach them to any flat iron surface. They won’t work on rubber or urethane coated weights. The magnets are strong, but not strong enough to reach through those materials effectively. They come in 1.5lb and 2.5lb sizes. 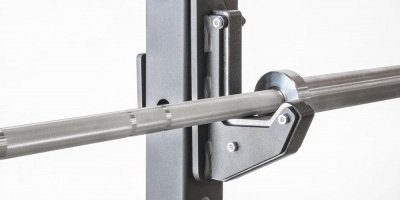 The hex shape can attach to the heads of hex dumbbells, or on the flat face of plates. The donut shape, being bigger, is overall less useful but works good on pro style dumbbells. The hole is only a bit over 1″, so you aren’t going to fit it over an olympic bar, but stuck on the flat face of a 45lb iron plate it works great. Weight lifters often overlook aerobic style wrist weights. They’re comfortable, they come in pretty close to the weights we want for microloading, and having the weight on your wrist is very similar to adding to the weight you’re holding in your hand. Even with most dumbbells they don’t get in the way. You can get them in 1 lb or 2 lbs per wrist. Did this article help you? Leave a comment below to share your thoughts! So it is 1.25lbs per 7ft? The nice little chain circles you have pictured aren’t going to be so nice then with 7ft of chain. That whole section with the chains is screwy man. I have no idea anymore. It’s been a while since I wrote this. I will have to research it again to find out the weight of different sizes of chain. Do you have a link to 1/8″ chain that weighs that 1.25lbs per 7 inches? That is really think and I can’t say I believe it. Oops, that should be 1.25lb per 7ft. I will update the article shortly. Thanks for the note! Iron Woody and Rogue sells Micro weights starting at 1/4 # up to 1# weight. Rogue also makes Olympic 1 1/4 Olympic Plates. Thanks for the tip! I will check them out and update the article.